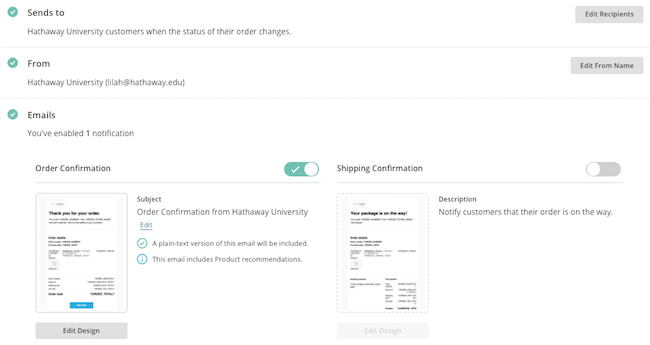 If you've connected your online store to Mailchimp, you can use automation to send order notifications like receipts, shipping confirmations, and more. Enable only the notifications that you need, customize them to reflect your brand, and add product recommendations to encourage repeat business. In this article, you'll learn about order notifications and how to create them. This automation will only work for users who have e-commerce data in their account from Mailchimp for PrestaShop, Mailchimp for Magento v. 1.1.5 or later, Mailchimp for WooCommerce 1.0.9 or later, Mailchimp for BigCommerce, or custom API 3.0 integrations. If you use Mailchimp's API, check out our E-Commerce API Guide to learn how to trigger each order notification type. You can only have one Order Notifications automation per connected store. If you manage multiple stores, you can create one order notifications automation for each. To make sure your customers don't receive redundant emails, we recommend you disable order status emails created outside Mailchimp. However, BigCommerce users won't be able to turn off their integration's version of the Order Confirmation notification, and may want to disable the Order Confirmation in Mailchimp. Order notifications are transactional emails that send to anyone who places an order in your connected store. Learn how transactional emails may affect your monthly bill. When you create an Order Notifications automation, we automatically populate the from name and from email address with information from your connected store. You can change these settings at any time. Sends a receipt to customers when they buy something from your store. If customers aren't charged at time of order, use the Order Invoice instead. Notifies customers that their payment has been processed. This is only recommended if customers aren't charged at time of order. If customers are charged at time of order, use the Order Confirmation instead. Notifies customers that their order is on the way. Notifies customers that their refund has been processed. Notifies customers that their order has been cancelled. Like Abandoned Cart Emails, Order notifications can be sent to anyone who gives their email address to your store, even if they're not opted in to receive email marketing. To create an Order Notifications automation, follow these steps. Enter a campaign name and click the drop-down menu to choose an audience. That's a good start. Now, you'll review your settings, design your emails, and start sending. After you choose your store, we'll display the settings for your order notifications. Here, you can edit your recipients, from name, and from email address, and make changes to your notifications and their subject lines. Order Confirmation may be enabled by default, depending on your e-commerce platform. If all you need is a simple receipt with no customization or logo, your automation is ready to go. BigCommerce users will instead see the Shipping Confirmation enabled by default. In the Emails section of your settings, choose which order notifications you want to send. After you enable a notification, you'll be able to edit its subject line and content. To enable a notification, toggle the slider from gray to green. To disable a notification, toggle the slider from green to gray. After you choose which order notifications you want to send, it's time to design them. The design process for notification emails works a lot like the Campaign Builder, with a few important exceptions. The body of the Order Confirmation, Order Invoice, and Shipping Confirmation includes order information that cannot be changed. Those three notifications also include a Product Recommendations block at the end, which can be customized or hidden. To design your notification email, follow these steps. In the Emails section, find the notification you want to work with and click Design Email. On the Design step of the Email Designer, choose to Edit or Remove the logo content block. If you don't change the default placeholder, we'll automatically remove it before sending. Your logo image can be any width, and up to 600px high. Change the headline and editable content, choose new colors and fonts to match your brand, or keep everything as is. Your headline can be up to 50 characters, and your editable content up to 200 characters. HTML and URLs are not allowed in these sections. On the Design tab , click each section to customize its colors, fonts, and other styles. Repeat steps 1-5 for each notification you want to enable. When you are ready to activate your Order Notifications automation, click Start Sending. In the Start Automation pop-up modal, click Start. In your integration settings, disable any email notifications that might cause you to send duplicate emails to your customers. Nicely done! Your order notifications are sending. If you need to make any changes, you can pause and edit the automation at any time. After your order notifications start sending, we'll track how your contacts engage with them. To view your order notification report, follow these steps. Navigate to the Reports page. Find the Order Notification automation you want to work with, and click View Report. On the report overview, you'll see performance statistics such as clicks, opens, and order data, which shows revenue from clickthroughs to your store. To learn more about how to interpret your notification statistics, read About Automation Reports. In the editable and fixed content of each order notification, you'll see merge tags that automatically pull in details about your customers' orders. You can add or remove tags as needed, or just edit around them. Here are a few tags you might want to add to your editable content. Use the customer re-engagement automation to win back customers who haven't purchased from your store in a while.